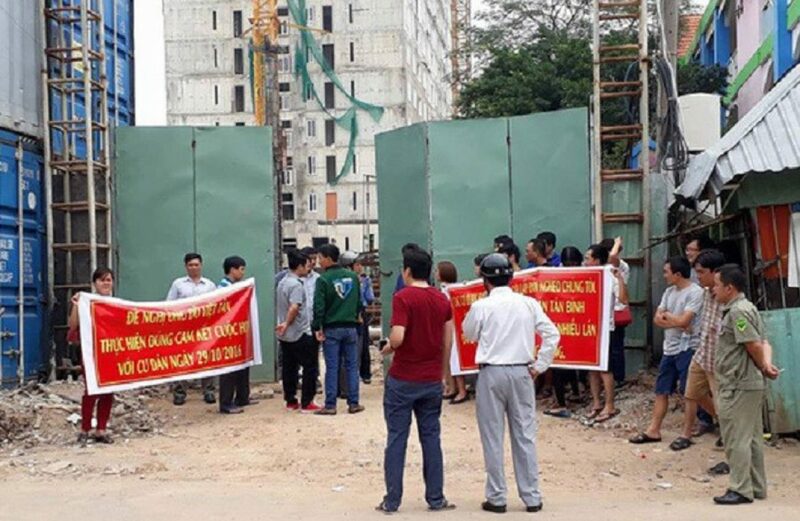 HCMC People’s Committee has just issued a decision to punish Tan Binh Real Estate Investment Company Limited (Tan Binh Company) because of many mistakes in the project of housing – social house that is an investment owner. City People’s Committee HCM punished Tan Binh Company for 19 administrative violations with a total amount of up to VND1.64 billion. The city also suspended the real estate business for 12 months, suspended construction activities for 6 months for this enterprise, forced to replace the director of the project management board because of incompetent as prescribed. Sanctioning decision of Ho Chi Minh City People’s Committee has set a record sum of the highest fines so far on administrative violations in building and trading real estate in HCMC. According to the People’s Committee of the city, the reason for aggravating circumstances with 19 violations is that Tan Binh Company has repeatedly violated many projects in the project with large scale, affecting the quality of works, causing urgent public opinion. In the sanctioned acts, there are 3 acts fined 300 million, including signing 67/117 purchase contract with customers, but apartment area is not determined by the area of ​​the apartment; There is no bank guarantee contract for financial obligations of the investor to the client in cases where the investor fails to hand over the house in accordance with the committed schedule; Signed housing purchase contract in the future when the Department of Construction confirmed the project qualify for sale. Particularly for this behavior, Tan Binh Company is fined additional suspension of real estate business to 12 months. With the remaining 16 violations, Tan Binh Company is fined from VND20 to 100 million. Violations such as failure to organize the pre-acceptance test, approval of construction drawing design documents; not checking the origin of goods labels, certification of standard conformity with construction materials. The company was also fined for not having enough social housing for lease as required; Collection of money in excess of the contract rate as prescribed. In addition, Tan Binh Company was also fined because it did not have enough capacity to practice to manage construction investment. This behavior caused the company suspended construction activities for up to 6 months. Even Mr. Do Viet Tan, Director of the Project Management Board, was not qualified to practice and was forced to replace him. You are reading the article The investor of Tan Binh Apartment project was fined VND 1.64 billion in the Real Estate category at https://realestatevietnam.com.vn/.Any information sharing, feedback please email to info@realestatevietnam.com.vn, Hotline 0909890897 (24/7). How Will HCM City Make VND 100 Million House?